Happy Friday, y'all! Yesterday was such a busy day in mom life. We ran errands, enjoyed a trip to the zoo, picked out pink paint for my front door (I finally convinced my husband to let me paint it pink), and then open house at my girls' school. I can't believe I'll have a second grader and a kindergartner on Monday! We love their teachers and we are all looking forward to an awesome school year. But I am feeling pretty emotional about sending my baby off to school. She's definitely a momma's girl. Change is necessary and apart of life but it ain't always easy. 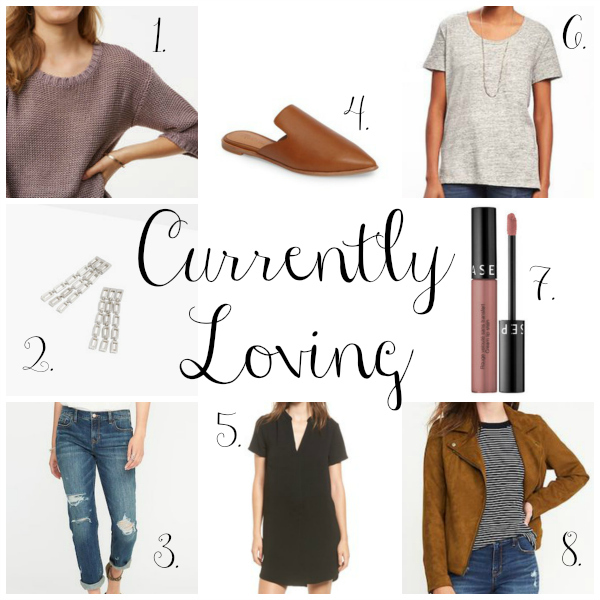 Today, I'm rounding up eight items that I am currently loving. As my kids are heading back to school, I know that fall is literally just around the corner. Everything I am purchasing lately in transitional because you can get more wear out of it. My favorite part of cooler weather is layering up so I am definitely on the hunt for layering pieces! 1. Sweater | I love, love, love the color of this sweater! This is a transitional piece because you can wear it now with shorts and sandals. I think it would also be super cute if you buy it a size or two bigger than you normally wear for a slouchy, comfy look. 2. Statement Earrings | How cute are these statement earrings?! I love the design of this pair and they are under $20! 3. 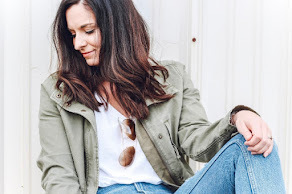 Boyfriend Jeans | I am currently loving boyfriend jeans! I recently bought another pair from Old Navy and they are my new favorite pair. I love pairing them with a super feminine top to balance out the look. 4. Mules | These shoes are at the very top of my wish list! They look like the perfect go-to shoe for fall. The color is so versatile and I'm loving the mule style. 5. Black Dress | You can just never go wrong with a little black dress! The crepe material of this one makes it appropriate for dressing up or down, depending on your occasion. 6. Tee | I bought this tee this week and it's going to be on heavy rotation. I sized up one size for an oversized, slouchy fit to wear with cute bralettes. You can't beat the price either! 7. Lip Stain | I have been searching for the perfect neutral lip color that lasts all day and this one is my current favorite! I actually received it in the mail in sample size and had to go buy the full size product because I loved it that much! 8. Moto Jacket | Y'all, this jacket will sell out so if you love, buy it today! I wanted a similar during the Nordstrom sale but I didn't want to spend the money. This one is half the price of the one during the sale and I love it just as much! Adding to my shopping cart now! Im loving your picks this week! Awesome round up! Loving all those items as well! Ah, I am loving those Madewell slides! NEED! I love number 4! I don't have a pair of mules but I think I'm gonna go buy a pair now! Great selection! Loving the mules and moto jacket.